SCSSS’s Sitabai Thite College of Pharmacy 1, Pune - Nagar Bypass, Behind Hudco Colony, Shirur (Ghodnadi), Pune - 412210, Maharashtra, India. Dr. V. V. P. F’s College of Pharmacy 2, Vilad - Ghat, Ahmadnagar - 414111, Maharashtra, India. ABSTRACT: Pyrazoline derivatives, being used as potential medicinal agents, 3-Acetyl-2H-chromen-2one (I) was prepared by Knoevenagel condensation of salicyladehyde with ethylacetoacetate in presence of piperidine. A series of 3-[(2E)-3-substituted-prop-2-enoyl]-2H-chro men-2-one derivatives (II a-h) were prepared by Claisen-Schmidt condensation of 3-acetyl coumarin with aromatic aldehydes. Treatment of 3-substituted cinnamoylcoumarin with hydrazine hydrate in the presence of ethanol gave [5-substitutedphenyl]-4, 5-dihydro-1H-pyrazol-3-yl]-2H-chromen-2-one (III a-h). 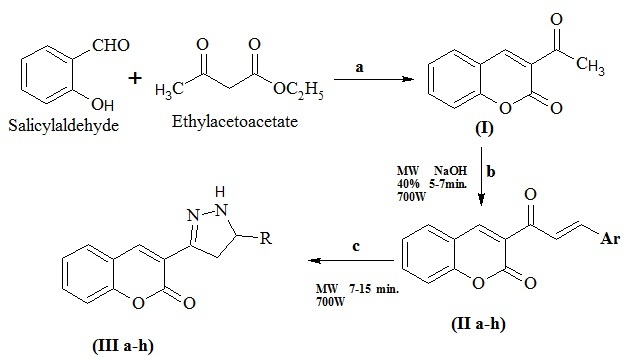 Title compound were synthesized by conventional as well as by microwave assisted method. The structures of the newly synthesized compounds were confirmed by IR and 1H-NMR spectroscopy. All the synthesized compounds were tested for their antibacterial and antifungal activities using cup-plate-agar-diffusion method. The antibacterial activity screening revels that the compound III b has comparable activity and compound III c shows moderate activity as that of standard ampicillin against gram positive and gram negative bacteria. All synthesized compounds were found to be inactive as antifungal against Candida albicans. INTRODUCTION: Heterocyclic compounds containing nitrogen and oxygen have received considerable attention due to their wide range of pharmacological activity 1. Natural, semi synthetic and synthetic coumarins possess a prominent place in drug research. Their utility stimulated the development of new synthetic routes for the preparation of coumarin derivatives. Moreover, coumarins have acquired a special place in heterocyclic field because of their diversified activities such as antimalerial 2, anticonvulsant 3, anti-inflammatory 4, antioxidant 5, cytotoxic 5, anti-HIV 6 and anti-microbial 7. Pyrazolines have played a crucial role in the development of theory in heterocyclic chemistry and also are extensively useful in organic chemistry. Due to interesting activity of various substituted pyrazolines as biological agents considerable attention has been focused on this class. The pyrazolines can be effectively utilized as anti-malerial 2, anticonvulsant 8, antidepressant 8, antiepeleptic 9, antidiabetic 10, antioxidant 11, anticancer 12, antimicrobial 13 and antitubercular 13 agents. Organisms become resistance to clinically used anti-bacterial drugs. 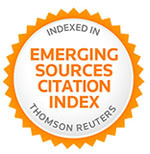 Hence search for newer and safer antibacterial agents is still very active and essential. Thus, we found it interesting to synthesize new heterocyclic compound bearing both a coumarinyl moiety and a pyrazoline as possible antibacterial agents. MATERIALS AND METHODS: Chemicals used in the synthesis of the title compounds described were purchased from S.D. Fine Chem. Ltd, Spectrochem Pvt. Ltd, Himedia and Loba Chemicals. They were different aromatic aldehydes, ethylacetoacetate, piperidine, Mueller Hinton agar and Sabouraud Dextrose Agar. These chemical were used as it is without further purification. All other LR grade reagents were used after purification using the literature methods. Melting points were determined with open capillary and are uncorrected. IR spectra were recorded in KBr pellets by using JASCO FT-IR 300E spectrophotometer. 1H NMR spectra were recorded on a Bruker - 400 MHz spectrometer using TMS as an internal standard. Progress of the reaction and purity of the products were ascertained by thin-layer chromatography (TLC) using silica gel G as stationary phase and various solvent combinations as mobile phase; the spots were visualized by iodine vapours. Preparation of 3-Acetyl Coumarin (I): 14 To a mixture of salicylaldehyde (1.8 g, 0.02 mol) and ethyl acetoacetate (2.5 g, 0.02 mol), 2 ml of piperidine was added by rapid stirring. After 20 min. the yellowish solid separated was filtered off and washed with ethanol. It was recrystallized from ethanol, it melts at 120 °C (lit mp 120 - 122 °C) and yield was 83.55 %. 1HNMR (CDCl3): δ 2.73 (s, 3H, -CH3); δ 7.32-7.68(m, 4H, -ArH) and δ 8.51 (s, 1H, C4 of coumarin). *Reagents and conditions: (a) Piperidine, stirr, rt, 20 min; (b) Ar-CHO, Piperidine / n- Butanol, reflux, 4hr; (c) Hydrazine hydrate, ethanol. General Procedure for the Synthesis of 3-[(2E)-3-substituted-prop-2-enoyl]-2H-chromen- 2 -one (II a-h): 15 A mixture of 3-Acetyl-2H-chromen-2-one (I) (0.01mol) and (0.012 mol) of the corresponding aromatic aldehydes was dissolved in 10 ml of n-Butanol under heating; then 0.3 ml of glacial acetic acid and the same quantity of piperidine were added. The reaction mixture was refluxed for 4 hr and then the solvent was removed under vacuum. The residue was triturated with 20 ml of ethanol until a precipitate formed, separated by filtration and recrystallized by suitable solvent. The physical data of the synthesized compounds (IIa-h) are depicted in Table 1.
and recrystallized from ethanol. Similarly, all other compounds of the series (IIa-h) were synthesized. Their physical constants are given in Table 1. IR (KBr cm-1): 1731 (Lactone of coumarin), 1657 (α, β-unsaturated ketone);1HNMR (CDCl3): δ 8.61 (s, 1H, 4th proton of coumarin), δ 7.83 (d, 1H, =CH-Ar), δ 7.43-7.78 (m, 9H, Ar-H), δ 7.41 (d, 1H, =CH-CO). IR (KBr cm-1): 1732 (Lactone of coumarin), 1654 (α, β-unsaturated ketone);1HNMR (CDCl3): δ 8.58 (s, 1H, 4th proton of coumarin), δ 7.85 (d, 1H, =CH-Ar), δ 6.95-7.84 (m, 8H, Ar-H), δ 6.92 (d, 1H, =CH-CO), δ 3.86 (s, 3H, -OCH3). IR (KBr cm-1): 1716 (Lactone of coumarin), 1662 (α, β-unsaturated ketone);1HNMR (CDCl3): δ 8.60 (s, 1H, 4th proton of coumarin), δ 7.92 (d, 1H, =CH-Ar), δ 7.83 (d, 1H, =CH-CO), δ 7.34-7.69 (m, 8H, Ar-H). IR (KBr cm-1): 1734 (Lactone of coumarin), 1657 (α, β-unsaturated ketone);1HNMR (CDCl3): δ 8.55 (s, 1H, 4th proton of coumarin), δ 7.85 (d, 1H, =CH-Ar), δ 7.75 (d, 1H, =CH-CO), δ 6.67-7.75 (m, 8H, Ar-H), δ 3.05 [s, 6H, -N(CH3)2]. IR (KBr cm-1): 1712 (Lactone of coumarin), 1661 (α, β-unsaturated ketone);1HNMR (CDCl3): δ 8.64 (s, 1H, 4th proton of coumarin), δ 8.49 (d, 1H, =CH-Ar), δ 8.27 (d, 1H, =CH-CO), δ 7.38-8.00 (m, 8H, Ar-H). IR (KBr cm-1): 1731 (Lactone of coumarin), 1657 (α, β-unsaturated ketone);1HNMR (CDCl3): δ 8.57 (s, 1H, 4th proton of coumarin), δ 7.93 (d, 1H, =CH-Ar), δ 7.59 (d, 1H, =CH-CO), δ 7.21-7.87 (m, 8H, Ar-H), δ 2.39 (s, 3H, -CH3). IR (KBr cm-1): 1729 (Lactone of coumarin), 1657 (α, β-unsaturated ketone);1HNMR (CDCl3): δ 9.63 (s, 1H, -OH), δ 8.55 (s, 1H, 4th proton of coumarin), δ 7.81 (d, 1H, =CH-Ar), δ 7.73 (d, 1H, =CH-CO), δ 6.89-7.72 (m, 8H, Ar-H). General Procedure for the 3-[5-substituted phenyl]-4,5-dihydro-1H-pyrazol-3-yl]-2H - chro-men-2-one (III a-h): Hydrazine hydrate (0.02 mol) and ethanolic solution 10 ml of (0.01 mol) chalcone refluxed for 3 hr. The reaction mixture was poured on to crushed ice and stirred. The solid those obtained filter and wash with water and crystallized from appropriate solvents affording the corresponding (III a-h). The physicochemical and spectral data of synthesized compounds (IIIa-h) is summarized in Table 2. Microwave assisted General Procedure16 (Solution phase MWI) for the synthesis of the 3-[5-substitutedphenyl]-4,5-dihydro-1H-pyrazol-3-yl]-2H-chromen-2-one(III a-h): A mixture of substituted chalcone (0.01mol), hydrazine hydrate (0.02mol) and acetic acid (4 ml) in methanol (10 ml) were taken in Erlenmeyer’s flask. The reaction mixture was irradiated in a microwave oven for 7‐15 min. at (700 W) on completion of reaction (TLC) the reaction mixture was cooled at room temp and poured over ice water. The product separated was filtered, washed with cold water, dried and recrystallized from Suitable solvent. Similarly, all other compounds of the series were synthesized by using different aromatic aldehydes (III a-h). Their physical constants, yield are recorded in Table 2. IR (KBr cm-1): 3440 (NH), 2915 (CH2), 1596 (lactone of Coumarin), 1523 (C=C);1HNMR (CDCl3): δ 2.77 (dd, 1H, 4-Ht), δ 3.33 (dd, 1H, 4-Hc), δ 6.88 (dd, 1H, 5-H of pyrazoline), δ 7.21 -7.84 (m, 9H, Ar-H), δ 7.65 (s, 1H, 4-H of coumarin), δ 9.02 (s, H, NH). IR (KBr cm-1): 3436 (NH), 2919 (CH2), 1592 (lactone of Coumarin), 1492 (C=C);1HNMR (CDCl3): δ 2.77 (dd, 1H, 4-Ht), δ 3.35 (dd, 1H, 4-Hc), δ 3.75 (s, 3-H, OCH3), δ 6.88 (dd, 1H, 5-H of pyrazoline), δ 7.24 -7.84 (m, 8H, Ar-H), δ 7.65 (s, 1H, 4-H of coumarin), δ 9.02 (s, H, NH). IR (KBr cm-1): 3436 (NH), 2919 (CH2), 1677 (lactone of Coumarin), 1565 (C=C);1HNMR (CDCl3): δ 2.78 (dd, 1H, 4-Ht), δ 3.34 (dd, 1H, 4-Hc), δ 6.88 (dd, 1H, 5-H of pyrazoline), δ 7.32 - 7.84 (m, 8H, Ar-H), δ 7.65 (s, 1H, 4-H of coumarin), δ 9.02 (s, H, NH). IR (KBr cm-1): 3350 (NH), 2965 (CH2), 1700 (lactone of Coumarin), 1550 (C=C);1HNMR (CDCl3): δ 2.76 (dd, 1H, 4-Ht), δ 3.02 (s, 6H, -NMe2), δ 3.35 (dd, 1H, 4-Hc), δ 6.54 (dd, 1H, 5-H of pyrazoline), δ 6.77-7.84 (m, 8H, Ar-H), δ 7.65 (s, 1H, 4-H of coumarin), δ 9.02 (s, H, NH). IR (KBr cm-1): 3440 (NH), 2923 (CH2), 1697 (lactone of Coumarin), 1627 (C=C);1HNMR (CDCl3): δ 2.80 (dd, 1H, 4-Ht), 3.36 (dd, 1H, 4-Hc), 6.94 (dd, 1H, 5-H of pyrazoline), 7.31 – 8.394 (m, 8H, Ar-H), 8.40 (s, 1H, 4-H of coumarin), 9.02 (s, H, NH). IR (KBr cm-1): 3436 (NH), 2919 (CH2), 1677 (lactone of Coumarin), 1573 (C=C);1HNMR (CDCl3): δ 2.21 (s, 3H, -CH3), δ 2.77 (dd, 1H, 4-Ht), δ 3.33 (dd, 1H, 4-Hc), δ 6.88 (dd, 1H, 5-H of pyrazoline), δ 7.05 -7.84 (m, 8H, Ar-H), δ 7.65 (s, 1H, 4-H of coumarin), δ 9.02 (s, H, NH). 1HNMR (CDCl3): δ 2.77 (dd, 1H, 4-Ht), δ 3.34 (dd, 1H, 4-Hc), δ 6.73 (dd, 1H, 5-H of pyrazoline), δ 7.16-7.84 (m, 8H, Ar-H), δ 7.65 (s, 1H, 4-H of coumarin), δ 9.02 (s, 2H, NH2), δ 9.18 (s, 1H, -OH). Antibacterial Activity: The measured quantity of inoculums of test organism (0.5 ml) was added to each heated (nearly ~ 55 oC) Mueller Hinton agar media tubes. The tubes were shaken well, and the inoculated media were poured on to the sterilized petridishes and then allowed to set in a refrigerator maintained at 4 - 8 oC. The test solutions of synthesized compounds of 40 μg/ml and 80 μg/ml were prepared in a DMSO. Cups of 7 mm diameter were cut in culture media using sterilized cork borer. The solutions of each test compounds (40µg/ml and 80 μg/ml) were added separately in cups. Ampicillin was used as standard reference drug and DMSO as a control. The petridishes were allowed to remain in the refrigerator maintained at ~ 10 oC for ~1 h to allow diffusion of the solution. The petridishes were then transferred to an incubator maintained at 37 oC and kept for 24 h. The zones of inhibition formed were measured by using calipers. The control of DMSO showed no activity. The activity of the test compounds are represented by size of the diameter in mm Table 3. Antifungal Activity: The measured quantity of inoculums of test organism (0.5 ml) was added to each heated (nearly ~ 55 oC) Mueller Hinton agar media tubes. The tubes were shaken well, and the inoculated media were poured on to the sterilized petridishes and then allowed to set in a refrigerator maintained at 4 - 8 oC. The test solutions of synthesized compounds of 80μg/ml were prepared in a DMSO. Cups of 7 mm diameter were cut in culture media using sterilized cork borer. The solutions of each test compounds (80μg/ml) were added separately in cups. Griseofulvin was used as standard reference drug and DMSO as a control. The petridishes were allowed to remain in the refrigerator maintained at ~ 10 oC for ~1 hrs to allow diffusion of the solution. The petridishes were then transferred to an incubator maintained at 37 oC and kept for 24 hrs. The zones of inhibition formed were measured by using calipers. The control of DMSO showed no activity. The activity of the test compounds are represented by size of the diameter in mm Table 4. RESULTS AND DISCUSSION: 3-Acetyl coumarin was synthesized by Knoevenagel condensation of salicylaldehyde with ethyl acetoacetate. Claisen-Schmidt condensation of 3-Acetyl coumarin with aromatic aldehydes gave 3-substituted cinnamoy lcoumarin. Treatment of 3-substituted cinnamoyl coumarin with hydrazine hydrate in ethanol gave 3-(5-substitutedphenyl)-4, 5-dihydro-1H-pyrazol-3-yl]-2H-chromen-2-one Fig. 1. The purity of the synthesized compounds was analyzed by thin-layer chromatography (TLC) on a silica gel G. The structure of synthesized compounds was characterized by spectral studies which include IR and 1H-NMR. In IR spectra of compounds (II a-h) the characteristic peak of C=O of α-pyrone and C=O of ketone were observed at 1735.01 and 1656.10 respectively; and in title compounds (III a-h) the characteristic peak of C=O of α-pyrone, C=N and C=C of pyrazoline were observed at 1720 - 1730, 1585 - 1600 and 1533-1545 cm-1 respectively confirmed the structure of the title compounds. Further, the structure was ascertained by detailed 1H-NMR study of the compounds. In 1H-NMR spectra of compounds (III a-h), the presence of three doublet-doublet between d 3.27 to 5.63 of -CH2 and -CH of pyrazoline and multiplet between δ 6.85 to 8.42 is characteristic peaks of aromatic protons in spectrum of 3-[5-substitutedphenyl]-4,5-dihydro-1H-pyrazol-3-yl]-2H-chromen-2-one reveals confirmation of structures. All these newly synthesized compounds (III a-h) were screened for antibacterial and antifungal activities by cup-plate-agar diffusion method. Result of antibacterial activity reveals that the compound (III h) showed comparable activity against gram positive and gram negative bacteria. Compound (III d) showed moderate antibacterial activity as compared to standard. Antibacterial activity was assayed using the cup-plate-agar-diffusion method using Mueller Hinton agar against Staphylococcus aureus, Bacillus subtilis, Escherichia coli and Pseudomonas aeruginosa using ampicillin as standard. The results of antibacterial studies are given in Table 3. The antibacterial screening data revealed that all the synthesized compounds showed moderate to good bacterial inhibition. It was observed that compounds III b and III c showed good activity against test organisms at 40 and 80 µg/ml as compared to standard drug ampicillin. Coumarinyl pyrazole carrying p-anisyl, and 4-chlorophenyl substituents at C3 of pyrazole emerged as active in antibacterial screening. Here strong electron withdrawing (halogen) substitution at ortho and para position and methoxy group at para position in phenyl ring were found to influence the antibacterial activity. Antifungal activity was assayed using the cup-plate-agar-diffusion method using Sabouraud Dextrose agar against Candida albicans using Griseofulvin as standard. The data of antifungal activity of synthesized compounds (III a-h) are depicted in Table 4. The antifungal screening data revealed that the synthesized compounds were found to be inactive against Candida albicans. CONCLUSION: As the some synthesized compounds showed antibacterial activity, further studies can be performed to evaluate the efficacy and safety of these derivatives. ACKNOWLEDGEMENT: The authors are thankful to Prof. D. G. Baheti Principal Sitabai Thite College of Pharmacy, Shirur for providing research facilities and encouragement. CONFLICT OF INTREST: Authors have no conflict of interest. Mahadevan KM, Arunakumar DB, Prakash GK, Kumaraswamy MN, Nandeshwarappa BP and Shrigara BS: Microwave assisted facile synthesis of amino pyrimidines bearing benzofuran and investigation of their antimicrobial activity. Indian J Chem. 2006; 45B: 1699-1703. Akhtar W, Faraz Khan M, Verma G, Shaquiquzzaman M, Akhter M, Marella A, Parmar S, Khatoon R and Mumtaz Alam M: Coumarin-Pyrazoline derivatives: Their One-Pot microwave assisted synthesis and antimalarial activity. Journal of Pharmaceutical and Medicinal Chemistry 2017; 3(1): 5-9. Bhat MA, Siddiqui N and Khan SA: Synthesis of novel thioureido derivatives of sulfonamides and thiosemi-carbazido derivatives of coumarin as potential anti-convulsant and analgesic agents. Indian Journal of Pharmaceutical Sciences 2006; 68(1): 120-124. Lv HN, Wang S, Zeng KW, Li J, Guo XY, Ferreira D, Zjawiony JK, Tu PF and Jiang Y: Anti-inflammatory coumarin and benzocoumarin derivatives from Murraya alat. Journal of Natural Product 2015; 78 (2): 279-285. Arora RK, Kaur N, Bansaln Y and Bansal G: Novel coumarin-benzimidazole derivatives as antioxidants and safer anti-inflammatory agents. Acta Pharmaceutica Sinica B 2014; 4(5): 368-375. Yu D, Suzuki M, Xie L, Natschke SL and Lee KH: Recent progress in the development of coumarin derivatives as potent anti-HIV agents. Medicinal Research Reviews 2003; 23: 322-345. Cacic M, Trkovnik M, Cacic F and Schon EH: Synthesis and anti-microbial activity of some derivatives of (7-Hydroxy-2-oxo-2H-chromen-4-yl)-acetic acid hydrazide. Molecules 2006; 11: 134-147. Zuhal O, Kandilci HB, Bulent G, Unsal C and Bilgin AA: Synthesis and studies on antidepressant and anticonvulsant activities of some 3-(2-furyl)-pyrazoline derivatives. European Journal of Medicinal Chemistry 2007; 42: 373-379. Maruthi Rao B, Saarangi R, Bardalai D, Habibur R and Shaik HA: Synthesis, characterization and evaluation of anti-epileptic activity of four new 2- pyrazoline derivatives compounds. Scholars Journal of Applied Medical Sciences 2013; 1(1): 20-27. Ahn JH, Kim HM, Jung SH, Kang SK, Kim KR and Rhee SD: Synthesis and DP-IV inhibition of cyano-pyrazoline derivatives as potent anti-diabetic agents. Bioorganic and Medicinal Chemistry Letters 2004; 14; 4461-4465. Tengli AK, Badami S, Prashantha Kumar BR, Dongre SH, Ravi S and Ananda T: Microwave assiated synthesis of pyrazoline derivatives and their anti-angiogenic and antioxidant activities. Indian Journal of Heterocyclic Chemistry 2007; 16: 333-336. Karabacak M, Altıntop MD, Çiftçi HI, Koga R, Otsuka M, Fujita M and Özdemir A: Synthesis and evaluation of new pyrazoline derivatives as potential anticancer agents. Molecules 2015; 20: 19066-19084. Ahmad A, Husain A, Khan SA, Mujeeb M and Bhandari A: Synthesis, antimicrobial and antitubercular activities of some novel pyrazoline derivatives. Journal of Saudi Chemical Society 2016; 20: 577-584. Al-Ayed AS and Hamdi N: A new and efficient method for the synthesis of novel 3-Acetyl coumarins oxadiazoles derivatives with expected biological activity. Molecules 2014; 19: 911-924. Gridnev YS, Saraf AS, Pogrebnyak AV and Oganesyan ET: Synthesis and study of structure-antiallergic activity relationship in a series of 4-R-3-cinnamoyl coumarin derivatives. Pharmaceutical Chemistry Journal 1995; 29 (11): 31-34. Nikalje AP, Malhotra P and Pattan S: Microwave assisted synthesis and anti-inflammatory activity of 3, 5-diaryl substituted-2-pyrazolines. 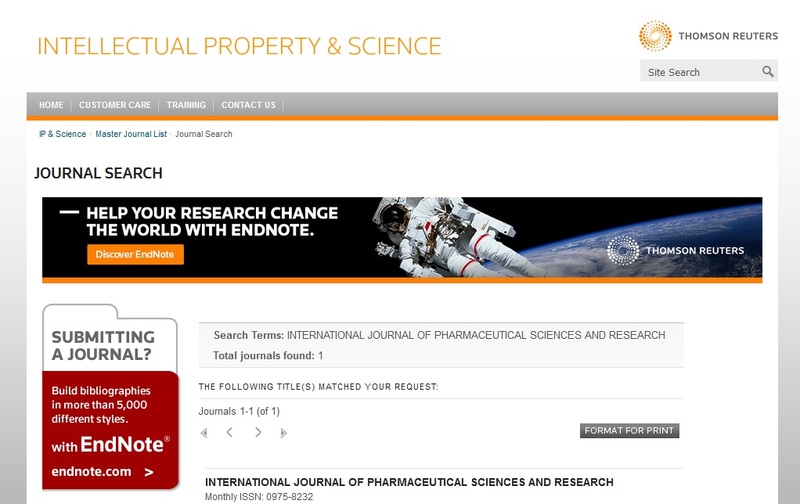 International Journal of Phar-macy and Pharmaceutical Sciences 2010; 2(2): 21-26. Lunkad AS and Sawant RL: Conventional and microwave assisted synthesis of some new derivatives of coumarin containing pyrazoline and investigation of their antibacterial and antifungal activities. Int J Pharm Sci Res 2018; 9(7): 2852-58. doi: 10.13040/IJPSR.0975-8232. 9(7).2852-58.